I kind of doubt it, but that's what the article claims. I've wanted to try this place for a while, but haven't gotten around to it yet. It will have to go a long way to beat pizzas I've had at Pepe's and Zuppardi's. From Bon Appetit. It must be true. I've been to Pizzeria Bianco many times since my relocation. I'll have to visit this place in Philly during my next visit. Clam pie from Pepe's. Best pizza ever. MH got ONE bite of mine and had to eat his plain pie, loving it. MMMM. My wife and I visited friends in northern CT a few weeks ago and had a clam pie from the Pepe's in Manchester. I can still practically taste it! 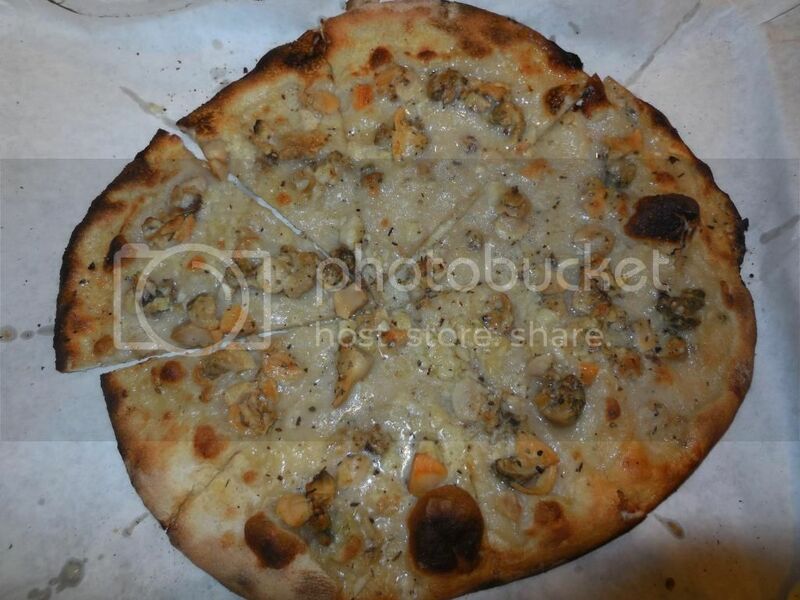 Although if forced to pick the best pizza I've ever had, it's possible I'd go with the clam pie from Zuppardi's. I think I prefered Pepe's plain pie to the plain pie at Zuppardi's though. You're killing me! I can actually taste the clams in the picture. Pies aside, how about Joe Beddia, entrepreneur? I his 'model': no phone, cash only. And lines patiently waiting for a taste of his 'magic' so long that even he admits that it isn't worth the wait. But, like Aaron Franklin, his true genius is in marketing. Play the video in the Bon Appetit link above. He leaves nothing 'secret'; he demonstrates his dough recipe, sauce recipe, and techniques on the video. And he even posts his sources on his menu! America's Best Pizza? America's Best Pizzaiolo? Those subjects are fun to talk about, but can hardly be objectified. No, the really fascinating story here is how he skillfully used social media, the high tech version of the most effective advertising known to man "word of mouth", to gain his present very enviable position. "Google him" and trace his rise; he got good at what he does, then he made the world notice. Stop it. Social media is a tool of the hipsters, primarily to drive quality restaurants out of business or alter their menus. I know because I read it here. And if TTM could manage to arrive at those quality restaurants during their operating hours, many more would stay in business. Even the tourists are starting to dwindle. Maybe more of those places should have TTM-friendly hours, eh? I suppose hipsters brought us arugula. Damn them. 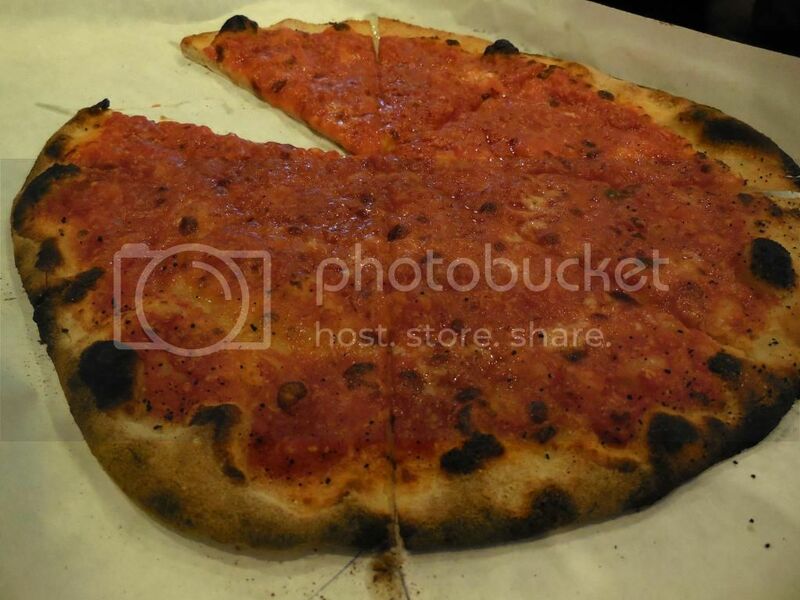 We all know, because we've seen your pictures, that you are definitely a master of pizza! Skip the arugula (although I do like it in a salad) and just keep making your beautiful pizzas! To heck with the hipsters!!! MJ - Thank you for sending me to the video. I could never find a satisfactory at-home pizza sauce. Joe's sauce is so simple anyone can make it. It turns out like the best pizzeria sauce and is better than any sauce found in NC. We adopted the rest of his techniques and ended up with the best pies that ever have come out of our countertop pizza oven. If we were in the area, we'd be in line at Beddia's. Pizza is hard to do yet at the same time it is not so hard. As in Beddia's example, it becomes an art to narrow down the exact ingredients and proportions and learn consistency. Patience is also a major virtue to get that consistency. The dough best epitomizes patience and consistency. That's the hardest to master and it is only flour, yeast and water as the base. Salt, sugar and olive oil is the fine tuning. Beddia's sauce is so simple you may want to slap your head the next time you throw in a half dozen spices in yours. The best ingredients, NYC water aside are well known and accessible across the country. Finally, high heat is the secret. That is probably why 500 degree home oven pizza is never quite right or comparable to pies you have at your favorite pizzeria. So well said, Davydd. And as we've talked about often on pizza threads......it's all about quality ingredients.....the right equipment......and the right touch. Less is more. I hate when places tinker...ie ,putting cornmeal under the dough...adding spices, sugars etc to the dough and sauce. Use REAL buffalo milk Mozz. San Marzano tomatoes(their unique taste is sufficient,don't spice it up! . Yes, hot ovens,preferably wood fired oven, or second best(it's easier) coal fired. A few short minutes and you're eating heaven. It's care and discipline, not always genius!!!!! Next time you're looking for the REAL thing, bring this check list! 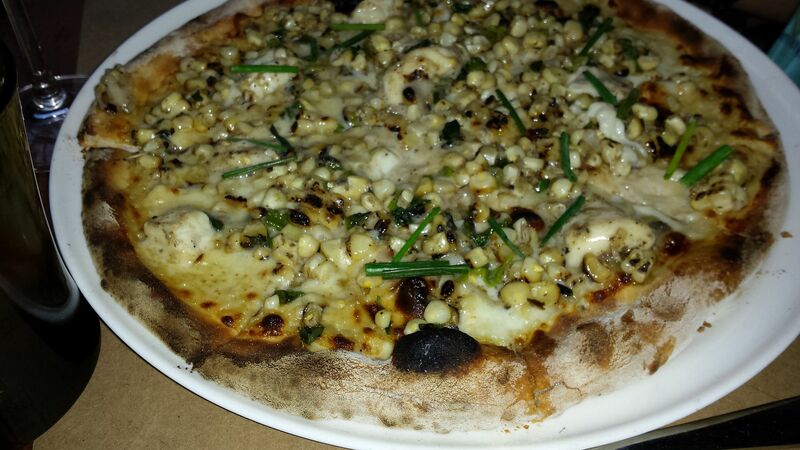 Oh, and Nino's coal fired pizza,here in Brick makes a mean pizza with arugula. It's a great once in a while change! Yet Beddia breaks those givens with the cheese, tomatoes and gas oven. 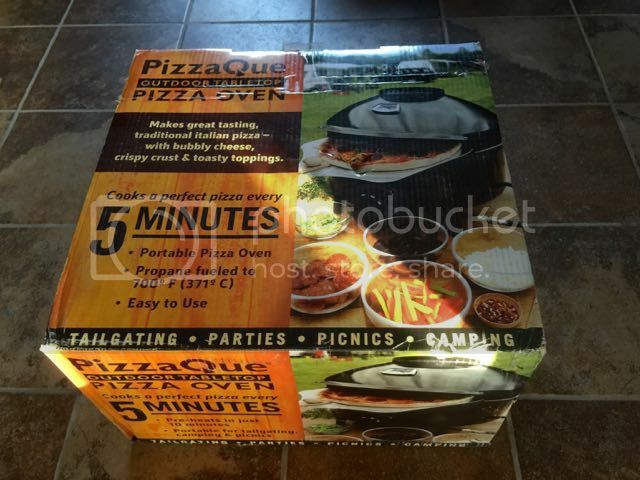 A lot of guys and gals on Pizzamaking.com are using a backyard pizza maker called a Blackstone oven that delivers the high Neapolitan like heat with a propane burner on a rotating stone with impressive results. One thing I do know even with my aging taste buds and mostly a diet on scratch made pizzas is I can now taste just about everything in a pizza including all the artificial preservers, extenders, processed ingredients or preparation and chemicals in commercial pies, frozen pies and chains. I admit I eat the stuff but can never say any of it is good in any way. It had been a while since I had a Pizza Hut pizza and early this year I almost gagged. I felt like I was eating chemicals. That might have been the first time I put a pizza down. I usually don't know how to stop eating when it comes to pizza. I force myself to stop at 4 slices in a sitting!!!! The Blackstone does work really well. I don't own one yet, but i have a friend who bought one when they first came out. it's not too expensive, about $350 now and it's a pretty ingenious design. it actually has 2 round pizza stones. the upper stone is stationary and the lower stone rotates. the single propane burner heats both stones and is adjustable as to how much top or bottom heat you want. the rotating motor can operate on batteries or ac power making it semi-portable.. it's really not meant to be very portable though. it can heat up to 1000 degrees F in a no wind condition. and i know from personal experience that it will bake a 10" basic sauce and cheese in less than 2 minutes. my only complaint is that the paint that they used burns off of the oven really fast, so you have to worry about it rusting.. maybe they will make an all-stainless steel version someday? that's the one i would buy. The 2Stone oven is a similar design with the rotating stone and is stainless steel and seemingly much better build quality. I'm guessing it would last better. It does cost considerably more thus not as many advocates out their baking pies. Both are interesting concepts for achieving a Neapolitan style pizza that normally, for others here, is fired in a beehive type wood-fired masonry oven achieving high heat of 900F. It is all in the dough and about a 90 second bake to achieve a sublime crust. I'm going to give a PizzaQue a try. I actually got this last Christmas but being on the road in our RV until June 1 and then having remodeling and painting going on all this month at our house I haven't had a chance to try it out. 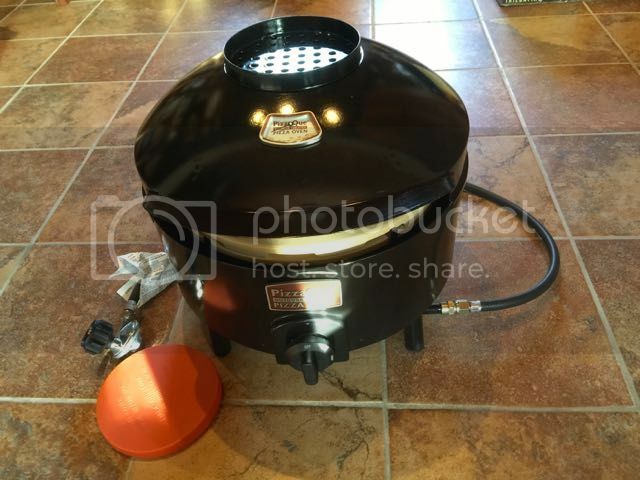 It is a propane burner fired oven with a stationary stone. However the stone is a two piece design supposedly to disperse the heat more evenly. You might have to use your peel and reposition the pie while baking but that is what you have to do in a wood-fired oven and it becomes an active and similar task. To me that is part of the art of pizza making. But the real reason is this thing will fit inside my space challenged camper van. I could take it on the road. Wow....fascinating. I can't wait for your review, hopefully with pictures of great looking pies!!!! I had dinner with my wife and family at Osteria in Philadelphia tonight. It's not really a roadfood type of restaurant and some of the toppings aren't what you'd find at a typical pizza place. But they do make exceptional pizza. I wouldn't call it the best in the world, or even the best I've ever had. But it's up there with the best I've had in Philadelphia, if not the best. 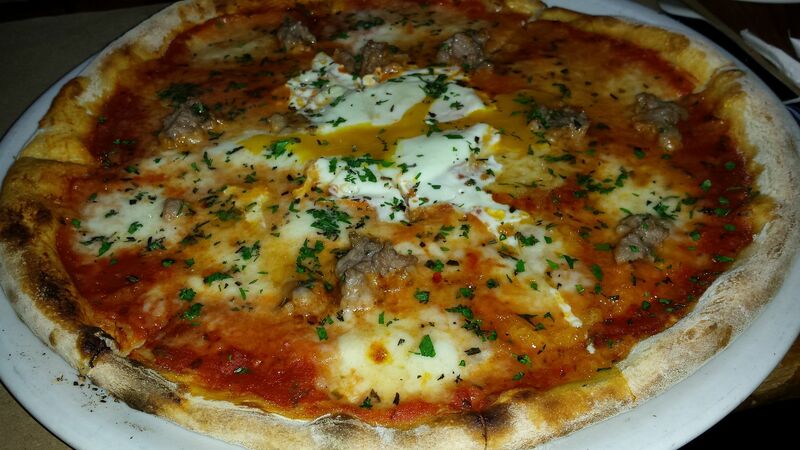 My sausage and egg pizza wilted in the middle, but I think with all of that egg and sausage, it would be tough for it to stay firm. I had a margherita pizza the only other time I ate there and that crust didn't wilt at all. Yes,those are great looking pizzas!!! ... I can now taste just about everything in a pizza including all the artificial preservers, extenders, processed ingredients or preparation and chemicals in commercial pies, frozen pies and chains. Would you be willing to participate in a blind taste test? Thanks philmaestro for reporting on the pizza there. Now I know its a place I wouldn't seek out, simply because I am just not that adventurous of a pizza eater. I'm sure he'd pass with flying colors. The man knows his pizza.